Cambodia had been a successfully neutral state long after South Vietnam and Laos were plunged into war. Up through the end of the 1960s, the country's ruler, Prince Norodom Sihanouk, had managed to keep Cambodia at arm's length from the combatants. Although, as we saw in chapter three of the book, the U.S. was hostile to Sihanouk, intriguing against him and training rightist forces and Vietnamese ethnic Cambodians in Thailand and South Vietnam , most fighting involving U.S. troops or planes stayed on the Vietnamese side of the border. Similarly, although Cambodia was a transit zone through which supplies reached communist forces in South Vietnam, the North Vietnamese kept a relatively low profile, keeping to themselves and confining their sanctuaries to a fairly limited area. There was a tiny communist insurgency, but it posed no threat to Sihanouk's regime. This state of grace ended when Nixon, seeking a way to pressure North Vietnam (see the discussions about that country in the book, as well as the North Vietnamese bombing case elsewhere on this website), acceded to long-standing military demands and, with some enthusiasm, instituted a highly secret bombing campaign of the North Vietnamese facilities in Cambodia . The only effect of the bombing was to push the North Vietnamese away from the border and closer to the country's center, where they came in contact with greater numbers of Cambodians. 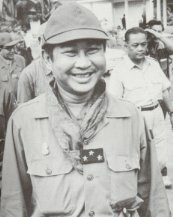 Sihanouk, weakened politically from his inability to end the North Vietnamese presence, was eventually overthrown by the military (the nature and extent of the U.S. role remains unclear), which had two profound effects: Sihanouk threw his lot in with the communist insurgents, and the country's new leader, Lon Nol, prepared to confront the North Vietnamese militarily (he also encouraged massacres of ethnic Vietnamese). Almost immediately, Nixon rewarded the new Cambodian government with military aid and flew in the anti-Sihanouk forces which had been trained by the U.S. over the preceding years; the South Vietnamese also began crossing the border in search of communist units. The North Vietnamese, caught between Cambodian and South Vietnamese forces, began moving away from the border and toward the country's capital, Phnom Penh . Nixon reacted to this by ordering a U.S. and South Vietnamese invasion of the Cambodian border region which, if not helpful to the Lon Nol regime (in fact, it drove the North Vietnamese closer still to Phnom Penh and for this reason was opposed by Lon Nol) would, it was thought, eliminate a source of pressure on the U.S. effort in South Vietnam. It gained at most three months, led to outraged protests in the U.S. and to the first successful congressional efforts to restrict the war, and, when Nixon bowed to the opposition and terminated the invasion after two months, left the Cambodian regime in a militarily dire situation. 1) VSSG Working Group, NSSM 99, “US Strategy Options for Cambodia,” Draft, 13 September 1970, 6, 11; National Security Decision Memorandum 89, “Cambodia Strategy,” 26 October 1970; both ProQuest (2005); Joint Chiefs of Staff to Abrams, Ivy Tree, 2835, 17 June 1970, quoted in Shawcross (1979: 214); U.S. Congress, Senate (1970: 4); U.S. Congress, Senate (1973a); Elder (1973); Hersh (1983: chs. 5, 15-6); Bundy (1998: 71-5, 145-64, 219-24, 385-99, 490-4); Clymer (2004: chs. 1-2). The one indispensable reference, at least until such time as the archives are fully opened, is Shawcross's Sideshow (1979), which is based on an astonishing number of documents, as well as interviews.